Born in St. Louis, Missouri, Knute Skinner has had a home in Ireland since 1964. He has taught at the University of Iowa and at Western Washington University, where he was a Professor of English. Retired from teaching, he lives in Killaspuglonane, County Clare with his spouse, Edna Faye Kiel. This book collects fifty years of published work, beginning with poems which first saw serial publication in 1957 and continuing through thirteen books. In a time when many poets cannot resist the grand gesture, Skinner's art is the achievement of presence in the places we go to: in field, kitchen, bar, dictionary, anecdote, joke, love bower. James Liddy on Learning to Spell "Zucchini"
surely the whitest cow I shall ever see. As usual with cows she is eating grass. to dazzle upon the rise of a grassy hill. with that white light breaking upon her body? commands the field with a curve of her delicate tail. owed to a white spirit by darker creatures. how their appearance enhances the white goddess. And yet their heads are lowered in due respect. although I see her only from my distance. I see her only through my grimy window. then with lowered eyes I could approach that whiteness. and would my eyes be blinded with revelation? and would she and I eat grass for the rest of our lives? 'Irish-America' was once a simple phenomenon - though painful for those forced by economics to be part of it. At the turn of the nineteenth century, Irish and American literatures intersected on the manner (and outcomes) of a westward exodus. The novella Maggie: a Girl of the Streets (1893) by Stephen Crane, better known for The Red Badge of Courage, depicted Irish immigrant life in the slums of New York. Ten years later, George Moore's story, 'Home Sickness' (in The Untilled Field) has in common with Maggie a character who is a Bowery bartender, though in this case he is one who makes an ill-fated return journey to the old country. When in America, he years for Ireland; when in Ireland, he yearns for America. Wherever he is, he'll suffer from home-sickness. Then, in 1963, JFK visited Ireland and the special relationship acquired new dimensions. Kennedy joked that if the travel arrangements of their respective forebears had been different, de Valera might have become President of the US, and he (JFK) would have been President of Ireland. It has been suggested that as Ireland became less oppressive for intellectuals and the US became more so, there followed a mini-exodus in the direction opposite to the traditional one. Better for an American poet to find himself among the culchies than among the hicks - especially if the former weren't really culchies after all, but in fact proved supportive of readings or festivals, and with an enthusiasm to rival that of the metropolis, Hibernian or otherwise. It's all a long way from Stephen Crane contemplating the degraded populace of Ballydehob. US-born poets such as Christ Agee, Ivy Bannister, Knute Skinner and Richard Tillinghast are integral to Irish cultural life. The last-named recently produced a full-length collection of essays on his adopted country, Finding Ireland (2008). The scale of the new relationship is reflected in UCD's development of its Clinton Institute of American Studies, and of course we should take into account the special impetus of America in the peace process of the North. and wringing their hearts in their hands till they've twisted them dry. On a similar note, 'Our Water Supply' ends with the eminently quotable lines: 'How good the spring water was when we had it - / like life itself, sweet, chancy and transient.' Another grimly grinning conclusion belongs to a much-cited Skinner poem, 'The Cold Irish Earth', set by the Cliffs of Moher near his Irish home (and from where he can look in the direction of his other homeland): 'but down at Healy's cross / the Killaspuglonane graveyard / is wet to the bone.' A bizarre ossuary in Rome - is there an ossuary that isn't bizarre? - prompts observations on the contrast between the stacked remains and the nervous tourists ('contractile fibres and sinewy tissues intact') heading for the exit to buy their postcards. when it comes to going down. and have their ups and downs. As line 5 suggests, the familiar form is further subverted by weird echoes of familiar poetry: William Cowper ('God moves...'), Shakespeare's Antony and Cleopatra ('They were dying, Egypt, dying') and W S Landor's 'Rose Aylmer' ('Ah what avails the sceptred race'). At this point, if I were more of an academic than I am, I'd be chuntering on about intertextuality. As it is, Skinner's 'The Customs of Queens' serves as a playfully compressed anthology of Great Lines, offering us a mordant take on female regality. And not a cute elephant in sight. Many of the poems in this retrospective volume are praise-poems to Killaspuglonane, where Skinner has lived (when off-campus) since 1964. Darker tones are never going to be far away in any Skinner poem, but he clearly identifies with the place and its people, enjoys both the rhythms and the quirks of rural Irish life. Two of his most remarkable poems, from the 1960s, juxtapose unassuming Killaspuglonane with the wider world-theatre: LBJ and Vietnam, the assassinations of Martin Luther King and Bobby Kennedy. Twenty years on, one of the poet's American personae muses curtly: 'old Ronnie addressed the nation / He wanted more of my money for the Contras' ('Friday Evening'). One of our WPA members, Knute Skinner, lives in Ireland. I emailed him to learn, among other things, what he might say about the importance of place in his writing. This request coincided with the debut of his latest book. This book, a retrospective collection titled, Fifty Years: Poems 1957-2007, begins with his first published poem, "Stars." The poems are labeled as "Early," "Later," "Fictions," and "Recent." Most of the poems were taken from 13 books that were published at two-to-three-year intervals from 1965 to 2005. The bulk of the Early poems were written whileSkinner was still in the United States; the majority of the rest were written in Ireland. wrote me, "with the people and the countryside. In a curious way, even though everything seemed strange, I felt at home." So two years after his first visit, he bought a small cottage, and has lived there ever since. By that time he had earned his PhD, but chose to raise a huge garden and "worked in a bog cutting turf to heat the cottage and feed the kitchen range." Although his permanent home was in Ireland, Skinner taught at Western Washington in Bellingham, where he founded the Bellingham Review, and taught "for periods ranging from one to three months a year." Regardless of which side of the Atlantic he was on, Skinner's work consistently demonstrates several qualities. One of them is his ability to tell a story through detail. Such is the case in "A Small Construction Site in County Monaghan," in which a young worker, like an eager horse in traces, wants to complete a job, but must wait while we watch his supervisor clean, fill, and successfully light his pipe. Suspense builds as the older man talks and tamps and finally can attend to the job. it is patience that he really must learn. That sort of wit, that twist, is another device Skinner has skillfully mastered. The ordinary becomes extraordinary, and life caught in a small moment is not what it had at first seemed to be. Also pervasive in his poems is Skinner's sense of place. In answer to a question I had asked him, he wrote, "Place has had a very strong influence, as my neighours pop up in my poems and a number of poems are set in the country side ...I live just two miles from Liscannor Bay, five from the Atlantic, where the Cliffs of Moher rise dramatically to about 700 feet from the water. But it's probably the hillside meadows and the ancient stone walls enclosing cows and sheep that appeal most strongly to me." 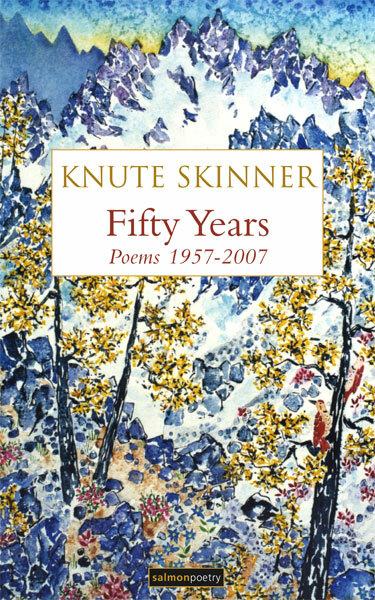 Reading through this collection, one meets Skinner's neighbors and family, learns things such as how long it takes to draw a pint of ale, and contemplates with the poet what it is like to suddenly catch oneself getting older.